Another zombie film has entered the fray but has found its own little niche in the market. The film follows the story of a small town that becomes infected with an unknown virus and the unknowing survivalist reality show crew that comes across this event. The shows host video logs found days later after he becomes infected may contain the only clues that the authorities need to help make a cure and save the world from its apocalypse. The films lead actor Gareth David-Lloyd (best known for playing Ianto Jones in 'Torchwood' and 'Doctor Who') stars as Jacob, the unfortunate survivalist who becomes infected. Throughout we see his demeanour change but his humanity stay in control as he changes slowly from man to zombie, all the while filming continues on his show. This is all shown by video footage obtained by a scientist and his team in a bunker and showing the footage to Jacobs cameraman in the hopes that he can obtain fresh information to help make a cure. This is a smart move from the creative team as it allows you to become emotionally connected with Jacob and his unfortunate demise. As we come to the end of the found footage the bunker where the hopes of a cure can be made becomes over run leaving the captured cameraman holding the only possible way to make a cure thus leaving the film and us viewers on a cliffhanger. The film does have its 'filler' moments but when you consider it is basically 3 men holding the film together this can be forgiven. 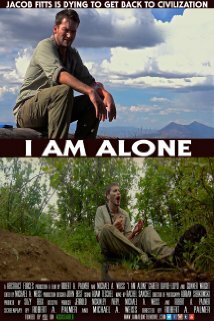 'I AM ALONE' is suspenseful throughout and with its use of elements from classic zombie movies and the directors own history of reality show making this is sure to be a festival and fan favourite for years to come.